Having a good website, designed it according to your brand and goals is a must nowadays since most customers look for information on the internet before buying any kind of product or service. 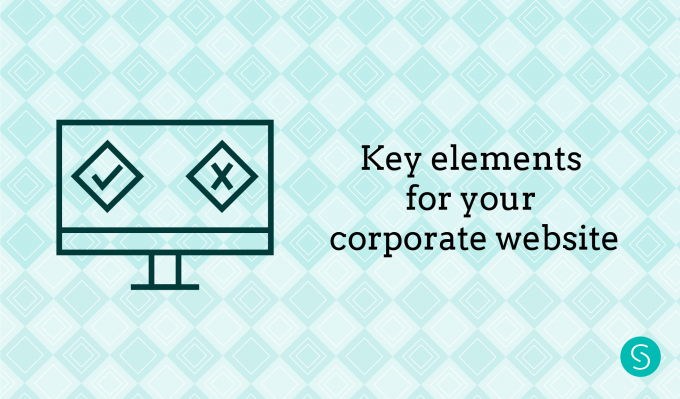 Sadly, I see a lot of websites that are inconsistent and bad designed, so here, I will explain you the key elements that your corporate website must have. Your corporate website is your home. When a customer finds your website and starts reading the information you are playing at home. You have the advantage because on your website you show your main benefits and everything is orientated to achieve your goals. Consistency: Brand Consistency is a must in your company as I pointed out in this post and of course, you have to keep it on your website too. Home: Home is the most visited page. It has to be visual and very attractive. It must be designed according to the company’s goals and It has to say what do you do and whom you help. About us: This is the most important page in your website. Most people don’t believe it but before buying your product or service, the user will go to the about page and will read what you have to say.You have to think carefully what do you want to say about yourself and your company. A general advice that suits every kind of company is to put a photo or photos about the employees and describe a little bit their role at the company. This generates confidence because people buy from people, not from a logo.Another good advice is to write the history of your company. Maybe your company has a very interesting one, or why did you start the business in first place? Besides it’s good to explain your workflow and how you help your customers to meet their goals. Services / Products: Here is where you have to specify the number of products / services you have and the main characteristics of them. It’s important because with this you are making clear what you can offer to them. Contact: The contact section is very important. Here you have to write how your target can contact you. By phone? Email? Social media? You have to choose which way of communication is best for your company and for your target and write it here.I advice you to have several ways of communication. For example,in my personal fact, I always prefer email address but on my website everyone writes me throughout the contact form. So as you can observe, your personal preferences don’t apply to everyone. Social Media Buttons: Nowdays is a must. You should place the buttons on your website. Common places are the footer and the contact page. But of course, you can place them on other pages too, it dependes on your goal and kind of website. Share Social Media buttons: The same happens with share buttons. This kind of buttons you can place them on your service / product pages. If someone likes your product / service he/she can share it on social media and you will get more visibility. Testimonials: This is a must. People trust in other people’s opinions,or didn’t you ever read some reviews/opinions on Amazon before buying a product?. If you have testimonials on your website this will help you a lot to get more clients.General places to put the testimonials are: home, about us, contact and service / products page. Footer: Here you can place your contact information, a sitemap, social media buttons and copyright info. Blog: If you are a small company a blog is a must for you. Probably you can’t afford expensive adds on TV or even on a newspaper. If you have a blog and you give value content to your target this will help you to have more customers. It’s a way to gain visibility on internet and confidence. As you can note my corporate website is not perfect. I’m currently working on a redesign. If you want to know the process that I’m following for this redesign let me know an I will publish a post about it.